SAMAN Portable office solutions is a reputed company that offers portable buildings. We have an ample amount of experience in this field. Thus, we can fulfill all the needs of clients in an effective manner. If you want additional space for your personal buildings, you can choose us for portable buildings. It is easy to install these buildings. So, it is a perfect remedy for accomplishing all the storage needs. Next, it is available in different sizes. Besides, they can make your life easy. Consequently, if you want to be organized and be on the right path to store the items in a proper manner, you can contact us. They are affordable: These structures need less raw materials in comparison to the buildings, built from scratch. Hence, they are affordable in comparison to the regular buildings. Next, you need reduced manual labor as they are manufactured in the factories. Second, to that, the delivery time of these buildings is faster. Also, you can get them from us at a cheaper price. Construction in no time: At times, you need to shift your office location owing to unavoidable reasons. In these cases, you need a building in no time. Hence, in these conditions, you can choose the portable buildings, available with us. Again, you can get them within the least duration of time. Besides, you will not face any delay in work as you choose us for the installation of these buildings. In addition, you can get it to the place of your choice without facing any hurdles. Ease of movement: Sometimes, you need to move to different locations for your next project. It is not feasible to build an office every time, you need to relocate. 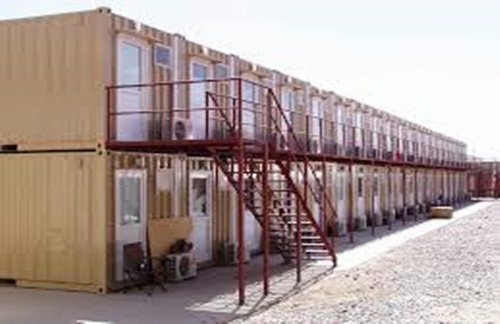 Thus, these portable buildings are an excellent choice during such times. They are portable in nature. Henceforth, you have the ability to move it from one place to the other easily. So, you can get it to the location of the next project easily. Your choice of the materials: You can get a wide assortment of options as you choose us to install these buildings for you. We ensure to deliver the buildings at ease, according to your choice. Another prominent reason why you should reach us for the installation of the buildings is that you will be able to choose on add-on features. We will customize these buildings over the next few years to satisfy your storage needs. We built these buildings for you with durable craftsmanship. Therefore, they are durable. We provide easy payment plans and hence, you will not face any issue at the time of making the payments. At SAMAN Portable Solutions, we know that you need space to accommodate our personal treasure. With our solid portable buildings, you can secure your personal belongings. They are cost-effective ways to protect your valuables. You may have a good business set up. However, there are times when you need to move to a different location. You can make these feasible by choosing our portable buildings. Again, if you need additional space for your office, you can choose these buildings, available with us. You will be able to save both time and money as you choose our services. In the same way, they are amazing in every aspect such as durability, quality, and rates. Likewise, you just need to call us and tell your requirements. We promise to deliver the portable buildings to your address within the scheduled time.